Mexico City is booming. The city with no fixed number of residents is food obsessed. The level of quality is generally so high that even a street stall could give you the best meal of your trip. This time we went all out and explored three of the most famous El pastor locations, ate blue corn quesadillas In the shadow of downtown’s ornate churches built on the ruins of Aztec temples. We reminded ourselves of the great societies that existed in the America’s before the conquest of Cortes by going to the great pyramids of Teotihuacan and the Museum of Anthropology which houses some of the greatest Prehispanic art in the Americas. We also visited many of the prominent museums and murals of the great artists of Mexico like Diego Rivera, David Alfredo Siqueiros, and Frida Kalho. In Mexico traditions thrive right alongside modern realities. Next to the Palacio Nacional is the Templo Mayor, dead center in downtown, as much as the conquistadors tried to exterminate the indigenous culture, it persisted. The food also reflects this, the ancient tortilla is still a humble vehicle even for high-end restaurants like Pujol where we had the pleasure of dining. This world renowned restaurant draws on the traditions of Mexico but presents them in a modern context with excellent wines to boot. In one day you could eat at a Michelin starred restaurant and eat tacos on the street and feel that they were both worthy of praise. That is why Mexico City is truly a place for those that wish to explore the art of eating. Check out our list below of some of the places to eat and visit that we like in Mexico City. As serious as the arguments about where’s the best cheese steak in Philadelphia, Chilangos (as people who live in Mexico city call themselves), is the discussion about where the best El Pastor taco is made. These tacos originated in the city and are a combination of pork, adobo, pineapple, onion and cilantro. Something so simple needs to be done right. Here are three options we thought were great, try for yourself and determine which you think is the best. Part of the fun is trying all these iterations and seeing the variety of just one kind of taco. Not a Pastor Spot but not to be missed! Old school spot, with small chairs and a constant line, these tacos were some of the best of the trip. We thought the Suadero (brisket) and the campechano taco were super solid. If you need to get your vinyl fix, we suggest going to this classic record store. Open for over 40 years they have all sorts of stuff and a knowledgeable staff to guide you around the store. When you visit Mexico City you have the ability to visit some of the greatest public art in the world. Take the time and visit some of these places and discover the works of Diego Rivera and others. Palacio Nacional -stand breathless in front of Diego Rivera's best work that stretches over many walls in the President's palace. Museum of Anthropology -housing the best collection of prehispanic art you have to see to believe. The greatness of Mexico is within these walls. Ministry of Education -Another of Diego Rivera's greatest works, you can cover three floors of this building gazing at Diego's frescos which praise the indigenous and industrial might of Mexico. 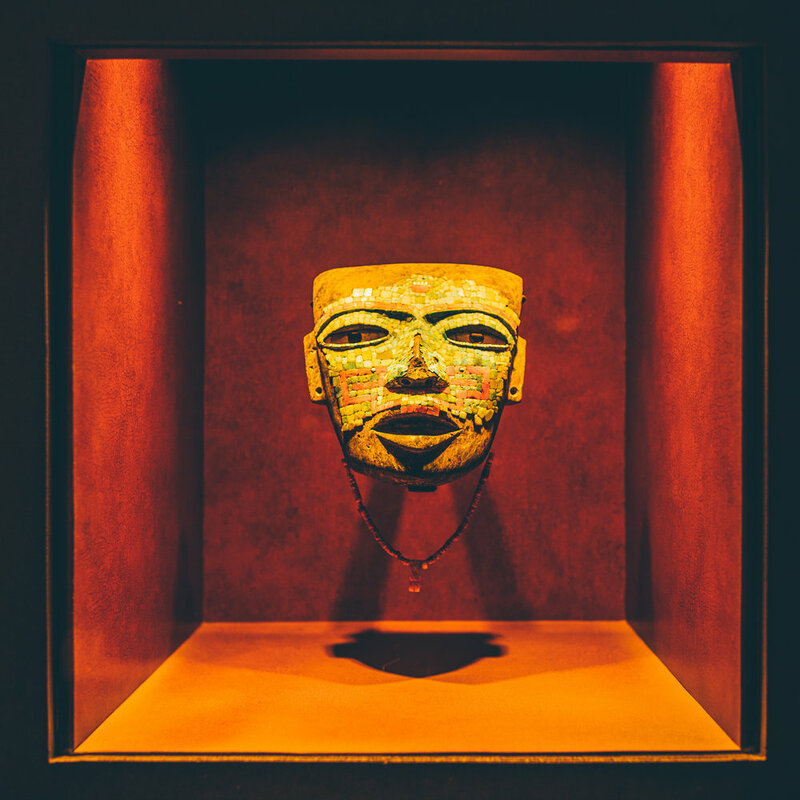 Anahuacalli Museum- Located in the south of the city, is Diego's personal museum housing his personal collection of artifacts from around Mexico. This museum is more like a personal show piece rather than a museum but is work the trip if you are really interested full breath of Diego's career. Palacio de Bella Artes - Housed in a building that looks straight out of Europe, you can find more murals by Mexico's best artists. The Blue house - Plan accordingly so as to avoid the lines, but go to the Blue House which houses the personal effects of Frida Kahlo. There you will learn about the incredible life of Latin Americas greatest female artist. I want to give a big shout out to Josh Landowski for letting us use his photos to make this blog post happen! He really helped us capture this trip. Some of our first memories of Oaxaca, Mexico are from reading recipes and descriptions of moles in cookbooks. Moles (the catch all term for sauce) are famous in this region with a world of variety to choose from, such as the black mole which involves over 27 different ingredients like bitter chocolate to estofado which is light in color, heavy on the cinnamon and served with olives. Another reason why Oaxaca attracted us is the Mezcal, and during our trip last year to Mexico City we fell in love. 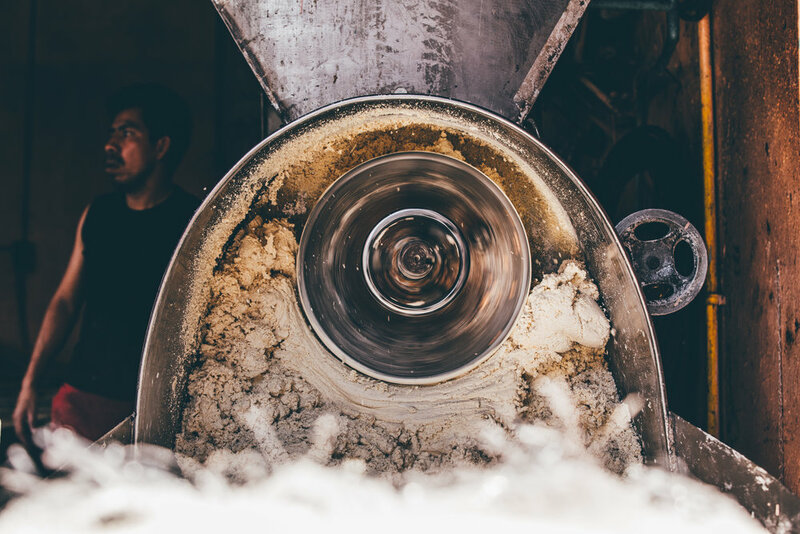 These distillations are mainly produced in the Oaxaca region and almost 85% of those produced are never exported. You have to travel to the source to taste the wild varietals from the mezcal makers themselves. With this in mind we knew that this years trip had to be to Oaxaca. Oaxaca is a small city built by the Spanish who established it in 1529. With the city designed on a grid it makes getting around by foot the best way to go. We spent days walking along the sidewalks getting lost only to look up and see the steeple of the large catholic church that anchored the central square to find our way back home. Since the city became a UNESCO world heritage site it has become a coveted tourist destination with the local government investing in pedestrian streets, additional street lights and heightened security. Within blocks of each other you can grab a small batch mezcal, eat at a great restaurant and finish off your night with Consomme (beef broth). Oaxaca city offers many of the classier dining options and great Mezcalerias, but when you venture out of the city you find indigenous groups maintaining their culture and food ways. Taking small taxi rides out of the city for short day trips is as easy as finding the correct taxi around the Mercado de Abastos, paying your fare and sharing a small car to the central square. If you have the time, making day trips could fill an entire itinerary. There are two main indigenous groups located in Oaxaca - the Zapotec and Mixtec. They may be the most dominant but an additional 50 different indigenous groups continue to live in the province. You see traces of these groups in the city but they really make their mark on the small pueblos dotted around the valley. Each day during the week a different pueblo will hold a market that will draw vendors from around the area. We found on visits to these different markets the diversity that can exist in just one valley, from Etla in the north of the valley to Zaachila in the south. Both communities prepared barbocoa completely different, Zaachila favoring maguey (the leaves of the cactus) where in Etla the meat tasted heavy of avocado leaves. Both use the name barbocoa but they couldn’t be more distinct. In this province you will find herbs, cheeses and preparations that do not exist in other places around the country. Oaxaca is a gastronomic area with food bursting out of every crevasse and we feel extremely lucky to have spent some time in this beautiful part of Mexico. A small restaurant run by American expats who have gone the extra mile to find some truly rare mescals for their customers. Not only great selections but some nice small bites. Small bar with a great mescal selection, craft beers from Mexico and a roof top terrace to watch the sun go down over plaza Santa Domingo. For people who really want to dive in the full world of mezcal, here you can find variety and very educated staff that can guide you through the world of distilled agave spirits. A great covered market where you go for lunch to get great typical plates of moles, empanadas, and soups. Look for the special passageway where there are the grill masters cooking up different cuts of meat and sausage for you to order. Certainly one of the ‘to do’ food activities in the city. Small restaurant specializing in native corn varieties done up in a variety of styles. Great for breakfast and lunch. Some of the best moles on the trip including a great version of the Oaxacan black mole. Small intimate space on the second floor near Santa Domingo. Some of the best barbocoa we have tried. A strong Zapotec influence on the market. Awesome variety of products beings sold with at least 25 vendors of barbocoa. A small city with a refurbished church housing the late artist Rodolfo Morale’s work of paintings and sculpture. The Market near by is a great place to catch a peek at a woman who dresses like Frida Kahlo and grab some food. Note: photos are in no particular order. Please reach out if you have any questions. Every year food carts that want to serve on the capitol or library mall have to be judged by 20 food cart reviewers to rate if your cart is among the best of Madison and can serve in these coveted locations. Food cart reviewers have these three categories to judge upon: Food score, Apparatus and Originality. This is a week long process for existing carts, while new carts are voted on one day. As you can see, food cart rankings are based on a average of each reviewers score with the highest and lowest scores removed. With some carts having 15 scores and others having 8, this not a fair statistical assessment to be based upon. Seniority points also play a huge part, with some vendors having 7 points added to their final score. El Grito has had features on food sites like Eater, local spotlights in publications like the Isthmus, Brava, Madison Magazine and the Capitol Times. Ranking second best food cart in the 2016 Isthmus Annual Manual, as well as 5 star reviews on Yelp and Facebook there is a disconnect from the food cart evaluations and public perception. We use and source the highest products available in Southern Wisconsin, sourcing our proteins from Underground Meats and vegetables from farms like Roots Down Farms. Restaurants like Forequarter, Sujeo, Sardine, Tempest, Merchant and Lucille use these same quality meats and source vegetables from local farms. There is a missconception that Mexican food is cheap. Our focus is on tacos, a food we will continue to specialize in and serve on the streets of Madison. We will continue to use the taco as a creative vehicle turning out new iterations and creations. Our whole brand is inspired by taquerias on the streets of Mexico, or taco trucks roaming the streets of Los Angeles. A taco can be used for any culture or cuisine, a vehicle for your own creativity. From Duck Confit to Roasted Cauliflower, we will continue to bring you new and inspiring dishes. 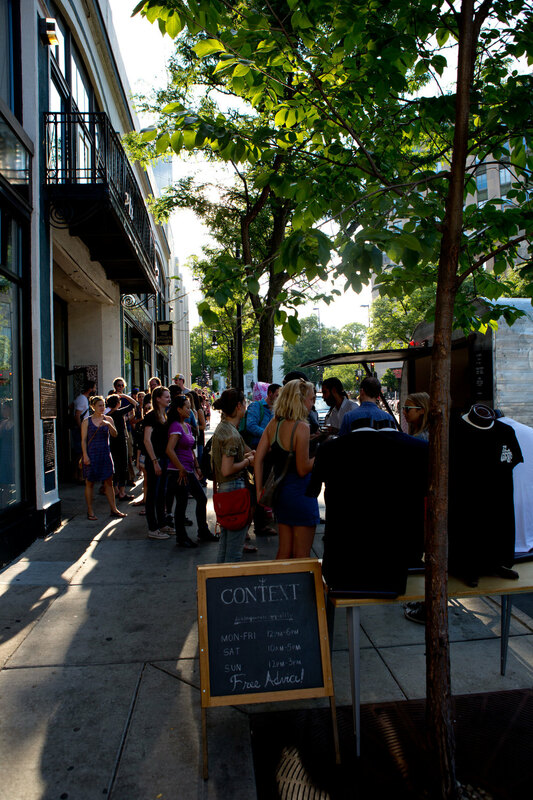 We're finishing up our outdoor vending season, but will continue to do indoor pop ups and collaborations. This winter we have trips planned for Mexico, Texas, California and a few others in-between. As you know, these trips are meant to give us inspiration for next years menu and we're excited to share with you our experiences. We'll continue to keep you updated on our outdoor vending locations for next year. Thanks again for the continued support. As our 1 anniversary approached we wanted to give back to everyone who had supported and allowed us to realize our dream of working for ourselves this past year. So why not set up in the same spot and try to recreate our grand opening; but this time around it's one cent tacos! Thanks to Ryan and Sam of Context Clothing, Justin from 5 Rabbit Cerveceria and to each and every one of you for the support this past year! Its been a while since we've updated you all and boy do we have a lot going on. We are happy to announce that El Grito is opening up a food truck in 2016! Like our trailer, we wanted to give Madison something they may not see everyday. Josh rides a 1949 Harley Davidson motorcycle and also drives our 1974 Ford F100 truck as his daily driver, so of course he was on the prowl for a vintage step van. By luck a friend sent us a link to a 1962 GMC Grumman (see below) in Pennsylvania which was exactly what we were looking for. to the El Grito team. pop up! Thanks of the support and let the good times roll! In Southern California, you find entrepreneurs sticking to the old ways and a new generation of Chicano and Mexican Americans redefining the taco working side by side. The newer chefs are allowing the diversity of the ethnic backgrounds of their customers to dictate their fillings. In California, tacos are as intertwined as they are in the fabric of Mexico. In California, tacos are done right. On a recommendation of a friend we checked out City Taco located in the North Park, an area that has seen a lot of changes over the past couple of years. Gerry Torres is taking classics and adding new ingredients and great technique. Although they are relatively new, they are sure to make a name for themselves beyond the borders of San Diego. A real stand out to this place is that they make both flour and corn tortillas on site, to order, ensuring that each filling is highlighted. Don't miss the Chile Relleno Taco - Beer-battered chile guero filled with Oaxaca and cotija cheeses, diced tomato, onion and cilantro served on a homemade flour tortilla. We also recommend the Rockfish Baja-style fish taco. The Estudillo family have been serving Mexican food here for three generations. Las Curato Milpas has been located on Logan Avenue since 1983 where there is always a line out the door. What they offer is a skeletal menu of basics all done perfectly; beef, chicken, rice and beans. The rolled tacos pictured were nicely crisped and well seasoned. The tortillas here were a real stand out on the trip. Orange County has long been a place for tourism, but as the expense of living in LA increases, it has forced people to look East into cities like Santa Ana. The reason we swung through this area was the three blocks filled with a variety of different regional Mexican food trucks. We recommend La Chiva Torta's Lengua tacos, and for the adventurous, the buche-fried pig intestines. Born in Boyle Heights and now spreading like wildfire with outposts all over LA, Guisados is a much lauded taqueria serving stewed-style tacos. Armando De La Torre Sr. & Armando De La Torre Jr. have tapped into a underdeveloped market of the taco game. In LA, where Northern Mexican styles that favor grilling are much more common, Guisados focuses on taco styles that you would see in other regions of the country. Being ranked the 17th best place to eat in LA, Guerrilla Tacos is a food truck that's impossible to miss. Wes Avila is redefining the taco as a street food and the public has taken note. On the day of our visit, we tried his Albacore Tuna Tostada with seaweed and togarashi. The star of the show, in our opinion, was his Sweet Potato taco with feta and an arbol chile salsa. Avila is constantly changing his menu to reflect what is fresh and what he is inspired by. This is an absolute must if you are visiting the Los Angeles area. Roy Choi has defined what it means to be an owner and operator of a food truck, not only in Los Angeles, but across the country. He has been able to seamlessly combine the disparate elements of ethnicities in LA and corral them into his tacos. His Short Rib taco is famous, with Kogi being the only food truck we visited where we had to wait in line. They are not only the first food truck to reimagine what you can serve out of a mobile food establishment, but the first to also harness the power of social media. If they tweet it, you will come. El Grito is always looking for ways to interact with our customers, and this winter we've been exploring setting up inside different locations around the Madison area. We've been grateful for the opportunity to set up inside the Majestic Theater for three nights where great local musicians played while we served our food. Recently our friends at Drunk Lunch graciously invited us to serve indoors, and the El Grito indoor pop up was born! Drunk Lunch is a newly opened lifestyle shop and creative space on Madison's near east side, which is the perfect venue for an indoor pop up. We met, we schemed and we created....... an indoor taco pop up like Madison has never seen. With the unexpected success of our pop up at Drunk Lunch I'm sure you'd agree Madison needs more of these spaces and events. Thanks to Drunk Lunch for being a great host and our good friends from Forequarter for providing their housemade cola. We're headed to the LA area for the first two weeks of February seeking more inspiration for our 2016 menu. Be on the lookout for an announcement about our next indoor pop up before spring! Mexico City is a surreal city where ancient and modern live side by side. It is a city positioned in a highland basin at 7,350 ft, with 22 Million in the general area. This is a city too big to be ignored. This is a city that must be explored. Somehow this metropole of the worlds 13th largest economy continues to be skipped over by Americans in favor of the beach cities. What you miss out on is a city reimagining its heritage through food and drink; where you can eat street food for lunch and have a tasting menu at night. A city with almost 200 museums rivaling Paris, many of which are free or very inexpensive. 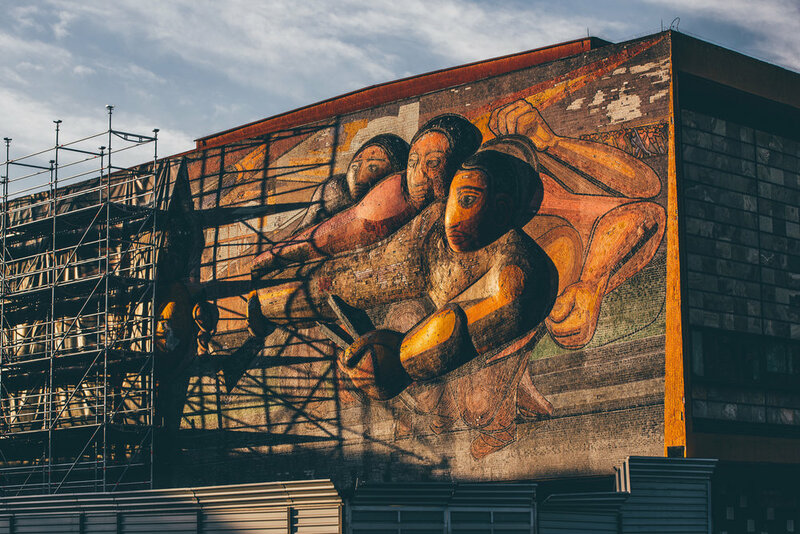 Mexico City or the 'D.F' (Distrito Federal) is where the best muralists of the past century lived and worked. You have to come here to see some of the greatest works of Diego Rivera or David Alfaro Siqueiros. Or you could just come to try all three of the restaurants that insist they are the originators of the Al Pastor taco whose cooking method using a vertical spit was brought by Lebanese immigrants and perfected in Mexico City with perfectly charred pork marinated in adobo served with onions, cilantro and pineapple. This is the oldest major city in North America and it shows. We stayed in the Roma neighborhood which can remind you of the streets of Paris with its architecture and street side cafés all mixed with the grit that is all Latin. Even though there were many new restaurants and chic bars in this area the places that were doing the best business were the street stalls, the mom and pops with a griddle cooking up their specialty and nothing else. 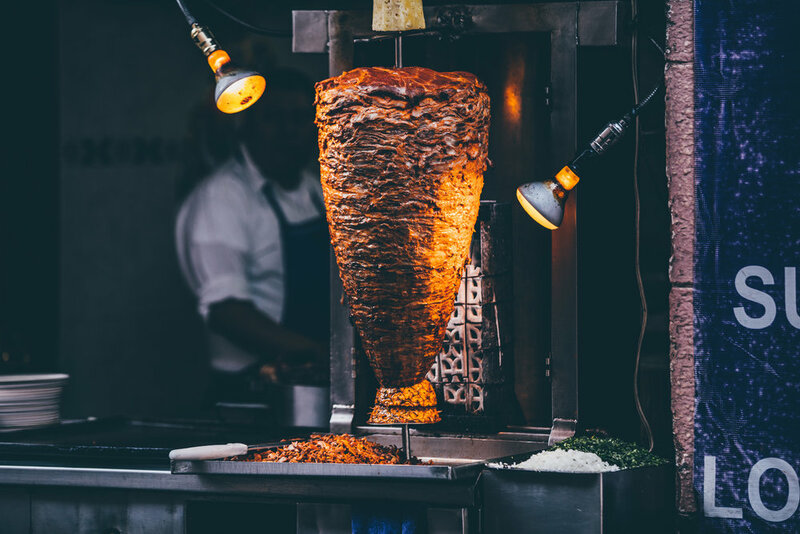 Mexico is a city where street food reigns supreme, where even the high-end restaurants have to compete with street food or sometime imitate it. Some cities have tried to sanitize their street food by putting it into food halls, Mexico’s cannot be reigned in. It’s unbridled. The variety is staggering and would take a lifetime to get a decent grip on. Representatives from every single region of Mexico have migrated to the capital and left their mark on the city. "Chilangos," as people of Mexico City call themselves, borrow the best of their country from the old to the new and put it on a plate.